Microsoft Antimalware for Azure is a free real-time protection that helps identify and remove viruses, spyware, and other malicious software. It generates alerts when known malicious or unwanted software tries to install itself or run on your Azure systems. The solution is built on the same antimalware platform as Microsoft Security Essentials [MSE], Microsoft Forefront Endpoint Protection, Microsoft System Center Endpoint Protection, Windows Intune, and Windows Defender. 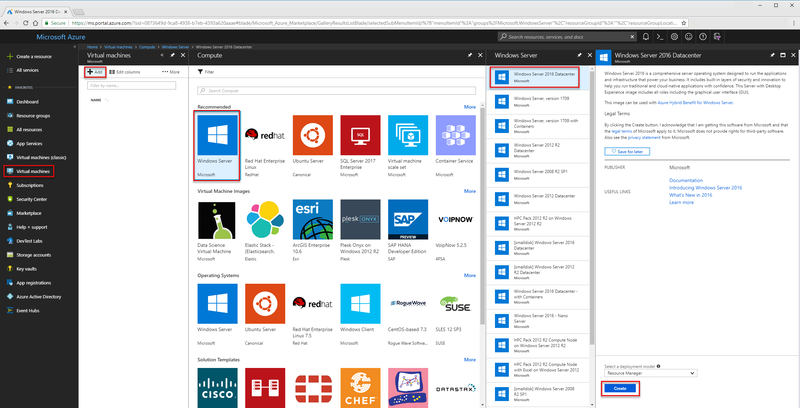 Microsoft Antimalware for Azure is a single-agent solution for applications and tenant environments, designed to run in the background without human intervention. Protection may be deployed based on the needs of application workloads, with either basic secure-by-default or advanced custom configuration, including antimalware monitoring. Real-time protection - monitors activity in Cloud Services and on Virtual Machines to detect and block malware execution. Scheduled scanning - Scans periodically to detect malware, including actively running programs. Malware remediation - automatically takes action on detected malware, such as deleting or quarantining malicious files and cleaning up malicious registry entries. Signature updates - automatically installs the latest protection signatures (virus definitions) to ensure protection is up-to-date on a pre-determined frequency. Antimalware Engine updates – automatically updates the Microsoft Antimalware engine. Antimalware Platform updates – automatically updates the Microsoft Antimalware platform. 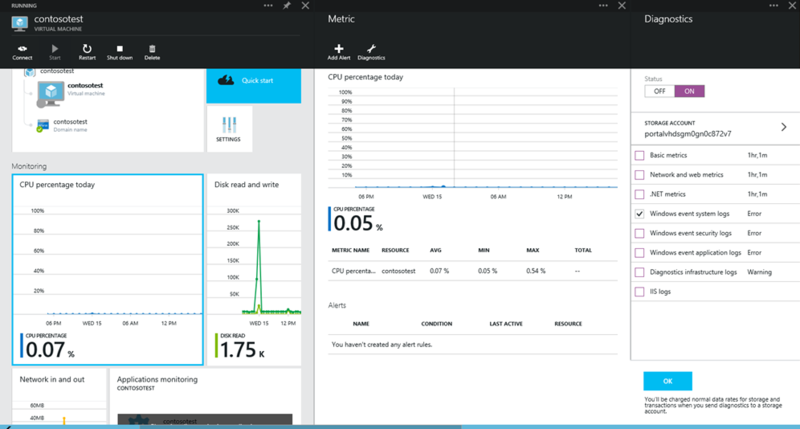 Active protection - reports telemetry metadata about detected threats and suspicious resources to Microsoft Azure to ensure rapid response to the evolving threat landscape, as well as enabling real-time synchronous signature delivery through the Microsoft Active Protection System (MAPS). Samples reporting - provides and reports samples to the Microsoft Antimalware service to help refine the service and enable troubleshooting. Exclusions – allows application and service administrators to configure exclusions for files, processes, and drives. Antimalware event collection - records the antimalware service health, suspicious activities, and remediation actions taken in the operating system event log and collects them into the customer’s Azure Storage account. Microsoft Antimalware can also be deployed using Azure Security Center. Read Install Endpoint Protection in Azure Security Center for more information. Microsoft Antimalware for Azure includes the Microsoft Antimalware Client and Service, Antimalware classic deployment model, Antimalware PowerShell cmdlets, and Azure Diagnostics Extension. Microsoft Antimalware is supported on Windows Server 2008 R2, Windows Server 2012, and Windows Server 2012 R2 operating system families. It is not supported on the Windows Server 2008 operating system, and also is not supported in Linux. The Microsoft Antimalware Client and Service is installed by default in a disabled state in all supported Azure guest operating system families in the Cloud Services platform. The Microsoft Antimalware Client and Service is not installed by default in the Virtual Machines platform and is available as an optional feature through the Azure portal and Visual Studio Virtual Machine configuration under Security Extensions. When using Azure App Service, the underlying service that hosts the web app has Microsoft Antimalware enabled on it. This is used to protect Azure App Service infrastructure and does not run on customer content. Windows Defender is the built-in Antimalware enabled in Windows Server 2016. The Windows Defender Interface is also enabled by default on some Windows Server 2016 SKU's see here for more information. The Azure VM Antimalware extension can still be added to a Windows Server 2016 Azure VM with Windows Defender, but in this scenario the extension will apply any optional configuration policies to be used by Windows Defender, the extension will not deploy any additional antimalware services. You can read more about this update here. The Azure portal or PowerShell cmdlets push the Antimalware extension package file to the Azure system at a pre-determined fixed location. The Azure Guest Agent (or the Fabric Agent) launches the Antimalware Extension, applying the Antimalware configuration settings supplied as input. This step enables the Antimalware service with either default or custom configuration settings. If no custom configuration is provided, then the antimalware service is enabled with the default configuration settings. Refer to the Antimalware configuration section in the Microsoft Antimalware for Azure – Code Samples for more details. Once running, the Microsoft Antimalware client downloads the latest protection engine and signature definitions from the Internet and loads them on the Azure system. The Microsoft Antimalware service writes service-related events to the system OS events log under the “Microsoft Antimalware” event source. Events include the Antimalware client health state, protection and remediation status, new and old configuration settings, engine updates and signature definitions, and others. You can enable Antimalware monitoring for your Cloud Service or Virtual Machine to have the Antimalware event log events written as they are produced to your Azure storage account. The Antimalware Service uses the Azure Diagnostics extension to collect Antimalware events from the Azure system into tables in the customer’s Azure Storage account. The deployment workflow including configuration steps and options supported for the above scenarios are documented in Antimalware deployment scenarios section of this document. You can however use Powershell/APIs and Azure Resource Manager templates to deploy Virtual Machine Scale Sets with the Microsoft Anti-Malware extension. For installing an extension on an already running Virtual Machine, you can use the sample python script vmssextn.py. This script gets the existing extension config on the Scale Set and adds an extension to the list of existing extensions on the VM Scale Sets. The default configuration settings are applied to enable Antimalware for Azure Cloud Services or Virtual Machines when you do not provide custom configuration settings. The default configuration settings have been pre-optimized for running in the Azure environment. Optionally, you can customize these default configuration settings as required for your Azure application or service deployment and apply them for other deployment scenarios. The following table summarizes the configuration settings available for the Antimalware service. The default configuration settings are marked under the column labeled “Default” below. The scenarios to enable and configure antimalware, including monitoring for Azure Cloud Services and Virtual Machines, are discussed in this section. To create a new virtual machine, navigate to Virtual machines, select Add, and choose Windows Server. Select the version of Windows server that you would like to use. Provide a Name, Username, Password, and create a new resource group or choose an existing resource group. In the next section, make the appropriate choices for your needs select the Extensions section. Under New resource, choose Microsoft Antimalware. In the Install extension section file, locations, and process exclusions can be configured as well as other scan options. Choose Ok.
Back in the Settings section, choose Ok. In the Create screen, choose Ok.
Connect to Microsoft Azure in Visual Studio. Select Microsoft Antimalware extension from the dropdown list under Installed Extensions and click Add to configure with default antimalware configuration. To customize the default Antimalware configuration, select (highlight) the Antimalware extension in the installed extensions list and click Configure. Replace the default Antimalware configuration with your custom configuration in supported JSON format in the public configuration textbox and click OK.
Click the Update button to push the configuration updates to your Virtual Machine. The Visual Studio Virtual Machines configuration for Antimalware supports only JSON format configuration. The Antimalware JSON configuration settings template is included in the Microsoft Antimalware For Azure - Code Samples, showing the supported Antimalware configuration settings. An Azure application or service can enable and configure Microsoft Antimalware for Azure Virtual Machines using PowerShell cmdlets. Use the Set-AzureVMMicrosoftAntimalwareExtension Antimalware cmdlet to enable and configure Microsoft Antimalware for your Virtual Machine. The Azure Virtual Machines configuration for Antimalware supports only JSON format configuration. The Antimalware JSON configuration settings template is included in the Microsoft Antimalware For Azure - Code Samples, showing the supported Antimalware configuration settings. An Azure application or service can enable and configure Microsoft Antimalware for Azure Cloud Services using PowerShell cmdlets. Note that Microsoft Antimalware is installed in a disabled state in the Cloud Services platform and requires an action by an Azure application to enable it. Use the Set-AzureServiceAntimalwareExtension Antimalware cmdlet to enable and configure Microsoft Antimalware for your Cloud Service. The Antimalware XML configuration settings template is included in the Microsoft Antimalware For Azure - Code Samples, showing the supported Antimalware configuration settings. An Azure application or service can retrieve the Microsoft Antimalware configuration for Cloud Services and Virtual Machines using PowerShell cmdlets. For Virtual Machines: Use the Get-AzureVMMicrosoftAntimalwareExtension Antimalware cmdlet to get the antimalware configuration. For Cloud Services: Use the Get-AzureServiceAntimalwareConfig Antimalware cmdlet to get the Antimalware configuration. 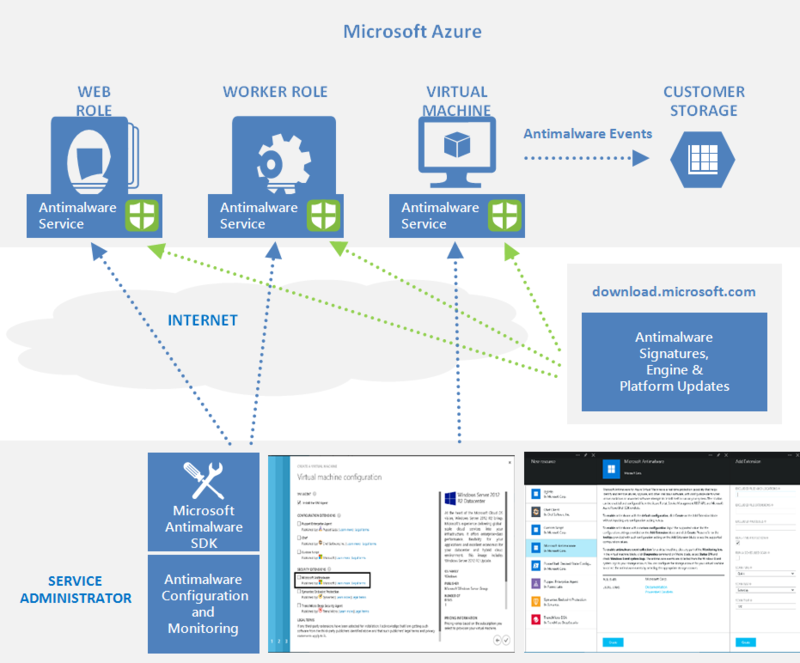 An Azure application or service can remove the Antimalware configuration and any associated Antimalware monitoring configuration from the relevant Azure Antimalware and diagnostics service extensions associated with the Cloud Service or Virtual Machine. For Virtual Machines: Use the Remove-AzureVMMicrosoftAntimalwareExtension Antimalware cmdlet. For Cloud Services: Use the Remove-AzureServiceAntimalwareExtension Antimalware cmdlet.
. You can choose to uncheck all other options in the list, or leave them enabled per your application service needs. The Antimalware event categories “Error”, “Warning”, “Informational”, etc., are captured in your Azure Storage account. Antimalware events are collected from the Windows event system logs to your Azure Storage account. You can configure the Storage Account for your Virtual Machine to collect Antimalware events by selecting the appropriate storage account. For more information on how to Diagnostics Logging for Azure Antimalware, read Enabling Diagnostics Logging for Azure Antimalware. You can enable collection of Microsoft Antimalware events for your Cloud Service or Virtual Machine using Azure Diagnostics through Antimalware PowerShell cmdlets. The Azure Diagnostics extension can be configured to capture events from the System event log source “Microsoft Antimalware” to your Azure Storage account. The Antimalware event categories “Error”, “Warning”, “Informational”, etc., are captured in your Azure Storage account. For Virtual Machines - Use the Set-AzureVMMicrosoftAntimalwareExtension Antimalware cmdlet with the Monitoring ON option. For Cloud Services - Use the Set-AzureServiceAntimalwareExtension Antimalware cmdlet with the Monitoring ON option. You can view the Antimalware raw events by looking at the WADWindowsEventLogsTable table in your Azure Storage account that you configured to enable Antimalware monitoring. This can be useful to validate that Antimalware event collection is working, including getting insight into the Antimalware service’s health. For more information, including sample code on how to extract Antimalware events from your storage account, see Microsoft Antimalware For Azure - Code Samples.